I suggest you read “Camelot and the Cultural Revolution: How the Assassination of John F. Kennedy Shattered American Liberalism” by James Piereson (Encounter Books, 2007). The “our nation is evil” idea came about, he says, because the people spreading it wanted to believe that JFK had died for the cause of civil rights, stricken down by a wave of hate from the heart of America. Hence on the one hand, assassination conspiracy theories including everyone down to the men’s room janitor at the CIA, and on the other, the chastising of Eeevil AmeriKKKa. When the war was finally brought to the American living room people went DUH and said to themselves “there have been millions of civilians killed directly or indirectly since 1960, not to mention thousands of Americans”. So people in America said “there has to a better way “. Pretty simple actually ! ps never underestimate the potential of free market business in easier places than Vietnam at that time . Even America’s version of freedom has it’s bottom line costs. Everything has a price. Obviously it wasn’t worth it to some people. To your last point, let me suggest that the WWII generation was a very different generation that had grown up with the depression. Also, the Left then was very much pro-Hitler and against US involvement in the “European war” until Hitler betrayed Stalin and attacked Russia. Otherwise, I believe that there would have been a lot of opposition. Finally, people then could be genuinely outraged when Pearl Harbor was attacked, unlike the hard Left and 9/11. I, too, am too young to remember the days – though my oldest sisters were affected by them. As I understand it, the military was reeling from loss of prestige and place, dealing with drugs, gangs, and corruption, and trying to come to grips with a whole new world. The actions that the press reported were not new – the coverage was. The reporting was one-sided, not because only one side committed atrocities but because one side censored and killed journalists and the other side did not. 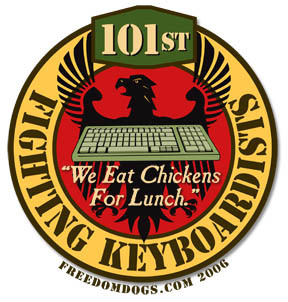 It persists to this day – even though the military has changed considerably in form. My mother, bless her, still does not quite understand why I still serve. Two of my sisters cannot comprehend why I ever joined in the first place. So many have taken the easy path, striking at targets that will not strike back (the Army, and indeed most of the DoD will not press slander charges) instead of looking at the whole of warfare and its inhumanity. People, including children and non-combatants, die in conflict regions. We don’t target them or place them in areas where we intend to fight. The enemy is not so considerate. We allow reporters and our archivists to view battlefields and report the good and bad with candor so that we can learn how to avoid hurting civilians. The enemy reports and stages scenes of death for propaganda while hiding their own atrocities. We charge, try, and often convict those who violate the Law of Land Warfare. They have no accountability, no evidence to be released, no trials for reporters to shadow, and no use for the law except to hamstring our efforts. In the long run, as with efforts now to verify, examine, and redeem the Vietnam conflict (We Were Soldiers Once, and Young; along with other accounts), it will come to be seen that the generation of the 60’s was easily corrupted, foolish, and flawed. Hopefully it won’t take forty years for history to fix my generation’s actions in the 90’s to today in the war against fanatic Islam. We are not what we were; we have yet to shed yesterday’s failings and become what we are destined to become. The Soviet propaganda machine was really top-notch. It got a whole generation of young Americans to repeat and believe its lies. And now an entirely new generation is repeating and believing the same lies. I think WWII presented a greater unifying effect. The nazis were real monsters committing unspeakable horrors. 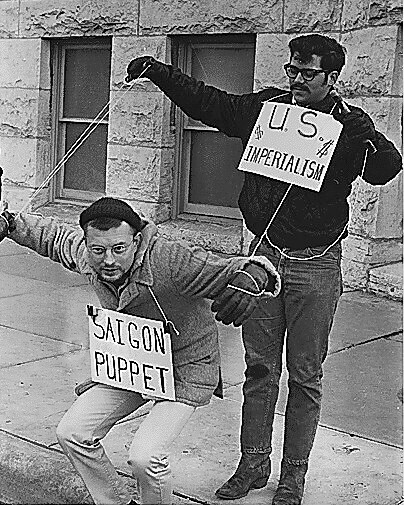 Vietnam was a stand against communism. Stoned, drunk, high as a kite and on acid, the youth probably thought communism was groovy. So why fight it? Maaaan. One of the things I found interesting about the Swift Boat action against Kerry was the information that it brought out about the propaganda by the Communists. This generation seems to have swept the threat of Communism under the rug, and view it as a boogeyman – just something to scare the children with, but not real. They’re foolish – it was real, and it’s still real – but transmogrified. The Communists planted the seeds of destruction within our society – particularly within the education system and the press, and we see the results today. Khruschev said “our grandchildren will bury your grandchildren” and we thought it was an empty threat. It hasn’t happened yet, but it’s still out there, in the ideals of the “progressives” who want an equality of outcome rather than the equality of opportunity which has been the hallmark of America. Unless we manage to take a step back from the brink, we will fall. You have got to read Neo’s latest series of posts about Vietnam, Book. There’s one of Neo’s posts I commented on. I have to go, so I am going to have to leave this topic for later. If folks want to read about the topic of America being at the mall with the Marine Corps being at war, go here to Villainous Company. My comment there spells out my thoughts on this subject, this dichotomy between an America at war and a populace disinterested in the struggle. But who created the original 1960s script, and how did it spread so rapidly and effectively that it became the accepted view that our American men and boys were brutal, imperialistic babykillers — end of story? For the capstone explanation, the grassroots social revolutionary movement engendered by Communism was very focused on figuring out ways to undermine and topple governments and societies. A complacent, wealthy, and satisfied society isn’t going to topple their government, after all. Thus to get rid of the government, one must foment strife, discord, war, and various other things that bring misery to the human race. I’ve read and heard reports that Arafat learned his propaganda strategy from the North Vietnamese and Chinese. The Vietnamese told Arafat, when he went there to meet with the revolutionary mob bosses, that if you frame your struggle in terms of national liberation and civil rights, you will have the Americans eating out of your hand. Europe too for that matter. But as for who started that propaganda line about Vietnam, the odds favor the Communist organizations such as the KGB. They were the ones, or the Russian army, that sent advisers and trainers to North Vietnam. The NVA, North Vietnamese Army, was trained by Russians. They learned everything they knew from Russians, except guerrilla warfare and knowledge of the terrain. Same with the US and Iraqis in Iraq. The Russians were already working on a systemic program of creating and utilizing useful idiots here in America. They had the CPUSA when nuclear secrets were leaked to the Soviets. And the predecessors to Stalin just kept up the propaganda line, because they believed. And their belief controlled the behavior and actions of every tentacle arm of the Communist ideology, party, and revolutionary movement in the world. Not only was the operators in the US, Vietnam, and China only successor states to the one that started it all, Russia, but most of the power balance went with Russia too. So they not only had an economic and causal incentive to go with Russian leadership, but also an ideological identity and loyalty as well. And of course, the idea that the useful idiots here in the US could rise above their station as tools to become Masters of Tools, is obviously preposterous. Those folks are followers, not spiritual leaders. They don’t got what it took. Obviously because they either didn’t know what was really going on, or they convinced themselves that it wasn’t really going on. The Russians spoke this truth, via Sergey from Neo Neocon, that Americans love an underdog. The title of underdog, the status of being weaker, is an automatic virtue to Americans because of American national character and personality. That means it is easy to manipulate. It is easy to utilize this tendency and create sympathy for terrorists and Palestinians. The North Vietnamese, you see, were just powerless villagers fighting to defend their home against the gigantuan American Imperialist army that was hell bent on exploitation, killing, looting, and rapine and child killing and all the things that the powerful do to the weak. That kind of propaganda works inversely proportional to how much truth people really know. And when the US media helped lie to the American people and keep them in ignorance, this created a moment of opportunity for Communists via Tet. See, in most of the rest of the world, being weak is no virtue. It has no virtue or advantage attached to it. But in America, being weak, being classified as a victim or freedom fighter, has both current and historical advantages and truths to it. Here in the West, meaning Europe and the North American continent, we can afford luxury, decadence, and intellectuals thinking up new ways why we can fail and why we are evil. Thanks, Y — very helpful. That’s exactly the type of info about disinfo that I was seeking. My only request is that you leave the rest of your comments at my new site, so that people can read them. Here, they’ll sort of wilt away. Via Villainous Company, here is an example of real reporting. Reporting that just wasn’t done for Vietnam. It wasn’t reporting. It was enemy propaganda. It was so democratic and kind of the Fench and Americans to look after the interests of the Vetmanese. The problo was that they didn’t thus the Ho , Russians and Chinese interests .Pretty simple stuff !